Fromex's Prints on Aluminum are a unique new product. Available in single or double panels, and four metal finishes. 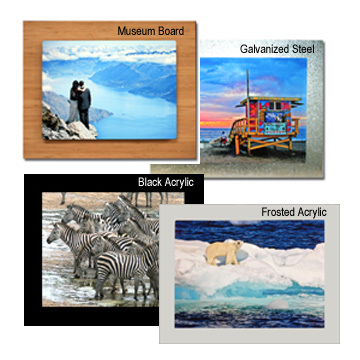 Using a 400 degree heat sublimation process, the dyes are infused directly into specially coated aluminum sheets. Your image is waterproof and virtually scratch resistant. White Gloss, White Matte, Clear Gloss or Clear Matte. Can't decide or have never seen aluminum prints? Order the 3"x5" Proof Sample Set and get your image printed on each of the four finishes for only $15 plus shipping. Brilliant high gloss surface that shows every detail. The aluminum has a white surface coating prior to the image transfer. This is the most accurate photo quality look, and is excellent surface for any subject matter. Same as above, but with a smooth, very even and soft appearance. Best if surface reflection is a concern. Natural brushed aluminum look with a glossy finish. Allows the brushed aluminum silver surface of the metal to show through in the white image areas giving it a metallic luminescence. A very modern and artistic look. Not recommended for light colors, best with dark colors or B&W images. Natural brushed aluminum look with a matte finish. Looks like metal. got any questions? we have the answers. order a sample of each finish! "I received my order today and am exceptionally pleased with the quality and speed of your service. The prints look amazing. Thanks!" 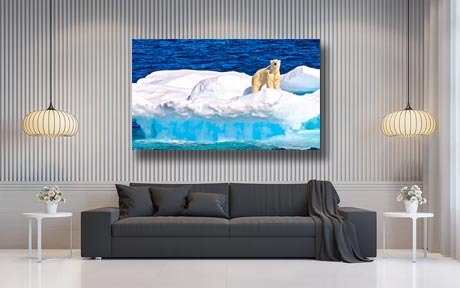 Single Aluminum Prints are available in sizes from 5x7 to 40x60, including many unique panoramic sizes. Custom sizes are priced at $0.35 per sq. in. If you want a permanently attached wall hanging bracket on the back, please select that option when ordering. The wall bracket and spacers allow the aluminum panel to float from the wall. We also sell small wrought iron easels for displaying aluminum prints up to 11'' x 14'' on a desk or tabletop, and black float frames for framing selected sizes. 3" x 5" or 4" x 4"
4" x 5" or 4" x 6"
5" x 5" or 5" x 7"
6" x 6" or 6" x 9"
8" x 8" or 8" x 10"
A single 8x or 12x aluminum print is floating in front of a background piece made from brushed aluminum, brushed or mirror stainless steel, galvanized steel, frosted or black acrylic, or bamboo museum board. This can produce a dramatic effect and beautiful wall decor. 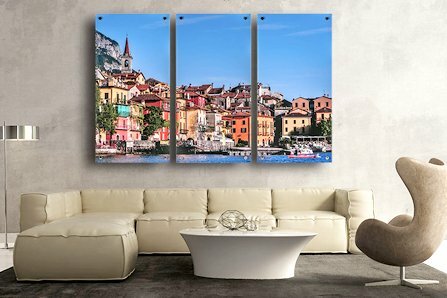 The beauty of mounting the single aluminum panel in a float frame is that it combines the traditional framed photo look with the modern aluminum print. It is only available is selected sizes. 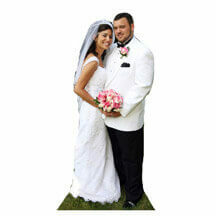 This is for a float frame only, order the proper size single aluminum print separately. We will ship complete ready to hang. 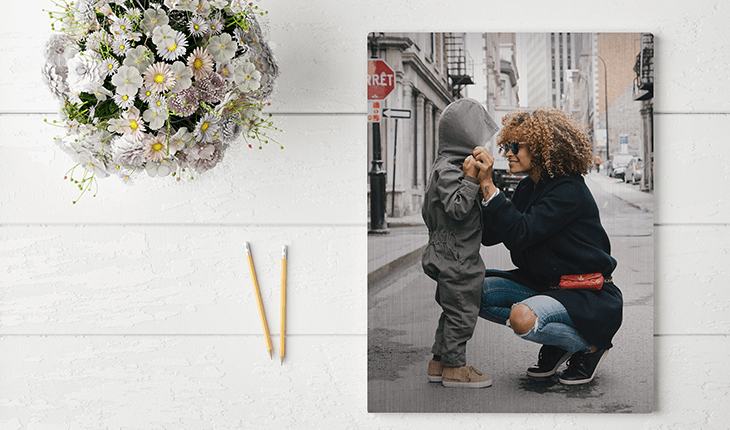 Double Aluminum Prints are a unique way to display your photos on metal. A single aluminum print is floated 1/2" off the surface of a second, larger print, creating a contemporary "framing" effect. The background piece can be one of our stock images, your image, or even the same image. It can also be displayed on an easel or with wall hanging brackets. 5" x 5" on 8" x 8"
5" x 7" on 8" x 10"
8" x 8" on 11" x 11"
8" x 10" on 11" x 14"
8" x 12" on 12" x 16"
12" x 16" on 16" x 20"
The collage allows you to float multiple aluminum prints on one background piece. The background can be plain brushed aluminum or printed with any image. We have pre-made templates for the most popular arrangements; or contact us for a custom collage design. If you want the ½" float wall hanging bracket on the back, please select that option when ordering. You can also add a text line to the bottom of most collages. 4 - 4" x 5"s on a 6" x 18"
4 - 4"x 4"s or 5"x 5"s on a 12" x 12"
3 - 4" x 6"s on a 10" x 18"